Love that the Bench BTS Back-to-School vid used the background track for Elevator … still LOVE that song to pieces…. Alright… so there’s Elevator … for you guys…. Awesome look back at David’s “Don’t Let the Sun Go Down on Me” from the AI7 finale on Masterclass Lady’s site HERE. 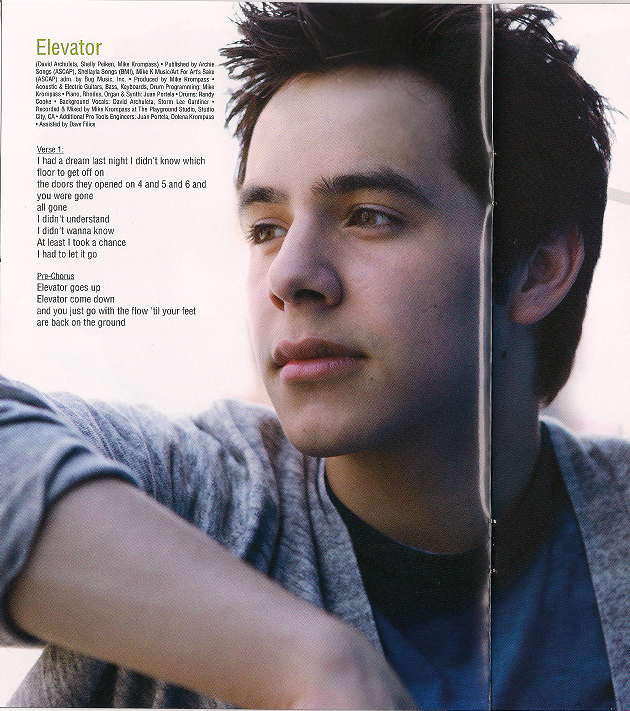 This entry was posted in Fan experience and tagged Bench rocks!, David Archuleta, Elevator. Bookmark the permalink. Oh Elevator deserves it’s own “Ode”! That particular video is amazing, my fave too. How sweet that we got another video, the BTS Bench vid is wonderful, feel spoiled, lol. Listening to Wise radio the other night while they featured David as the special artist and played so many of his great songs….was thinking (again) what a very unique and gifted performer he is. Listening to Elevator, Good Place, Forevermore album songs, his debut album songs, his A Capella songs and many more gems. There is just no one like David. Makes you feel rather privileged to experience his music and his unique soul in this young stage of his life. I’m sure many more will be experiencing it one day. From comments I’ve read, some new fans are emerging too, even while he’s away, love that. yikes, I woke up this morning with BOTW playing in my head IN DAVID’S VOICE! I CAN NOT believe we are getting his version of one of my very fave songs in 2 months!!! Z100 Elevator goes up and up> love that version eeeeeeeeeeeeeeeeee and it is beyong awesome that we keep getting little tidbits of David. I am feeling very blessed today. kimk.. Yes, she is. All I can think about is when Adele’s video of Chasing Pavements came out we were voting David’s Crush # 1 for weeks and weeks on VH1 and Adele was getntig slammed a lot. We made a few people very sore. Beautiful!! Had to listen twice!! Feb 18, 2007 posted. Thanks Refnaf!! What a beautiful rendition of BOTW. Just imagining David singing Eva Cassidy’s version gets me teary. BOTW, haunting…..two months, two months two months. peppertara, couldn’t listen to Wise Radio the other night, had company. Excited to hear that others are discovering his talent. And MC, masterclass herself, love her!